When John Gonsalves took an at-home DNA test last year to learn about his European ancestors, he had no idea it would lead to a meeting 40 years in the making. His daughter, Robin, gifted him an AncestryDNA kit for his birthday, which led to the discovery she wasn't his only daughter. "It's just as exciting to me to have a daughter who's 40 years old as one that's only one-month old," Gonsalves told CBS News' Elaine Quijano, who was there for their emotional meeting. Jeanie Siciliano was born in 1977 – the product of John's high school relationship – and was adopted two months later. When she was 19, she looked for her biological parents and found her birth mother but not her father. "I did some searching … but I didn't come up with any solid information. So I kind of put that all to the side," Siciliano said. "When I first opened my AncestryDNA.com results and John's name came up and underneath it, it said 'father,' and I was, like, 'Holy cannoli this guy is my biological father. Oh my gosh.'" Soon after, she wrote him a letter. "I was stunned. I literally felt the world stop and the second thought was, 'This is a scam. There's no way that I could have a child 40 years old,'" John Gonsalves said. "And then I started to cry. I felt joy. I was like, 'This is such a great gift.'" Two months later, the big moment arrived: a father finally with both of his daughters. "I get to chat with my daughters. It's no longer singular. It's plural!" John said. It turns out that John and Siciliano lived only three miles apart for 11 years and even shopped at the same grocery store. They think they must have crossed paths countless times, but believe it was divine intervention that brought them all together now at a time when they needed it most. In a way, Robin was responsible. 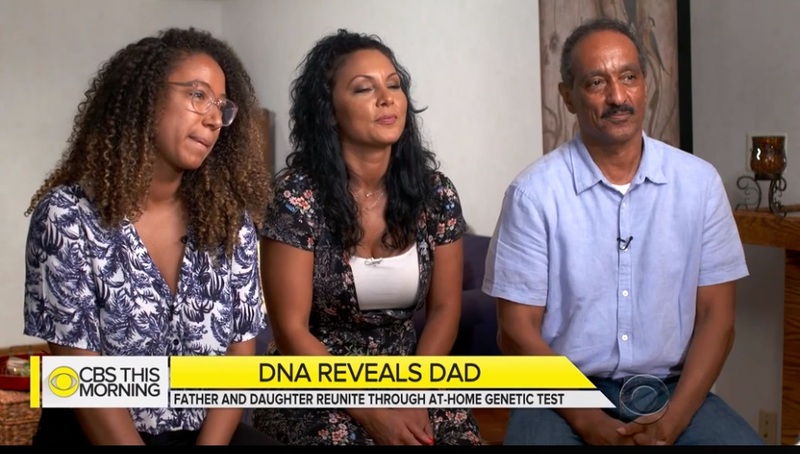 She gave her dad the DNA kit as a birthday gift. "I knew that he wanted it, and I never know what to get him and he had been talking about it … So I gave him the gift of another child basically for his birthday," Robin said. Robins said that having someone like Jeanie to look up to feels like a blessing. Robin's mother died a few years ago. "I think that when I lost my mom, the thing that I was most concerned about was, like, 'How am I going to navigate my dating life, like, without my mom?" Robin said. "I don't have too many women figures in my life but losing my mom was really hard. So it's important to have women to look up to. So having someone like Jeanie is really nice." "Nobody can obviously replace your own mother but like maybe I can be there for her," said Siciliano. "I'm also, like, super immature, so she'll probably make better, more mature decisions than I will. I'll be calling her, like, 'Dude, there's this guy and I don't know what to do.'"